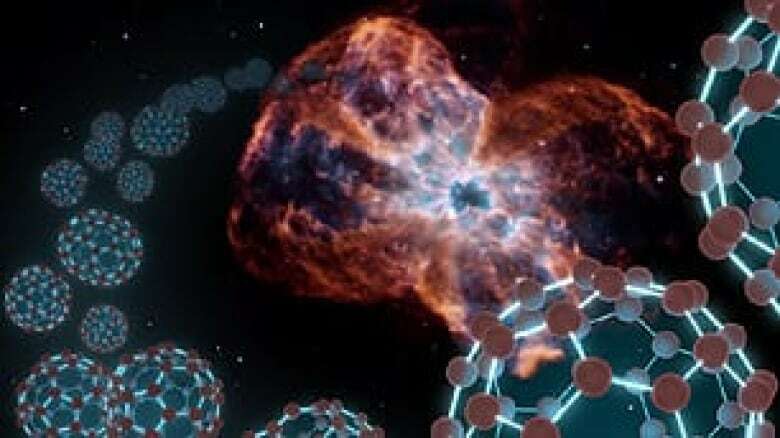 Soccer ball-shaped carbon molecules first discovered on Earth in the 1980s have been detected in outer space. 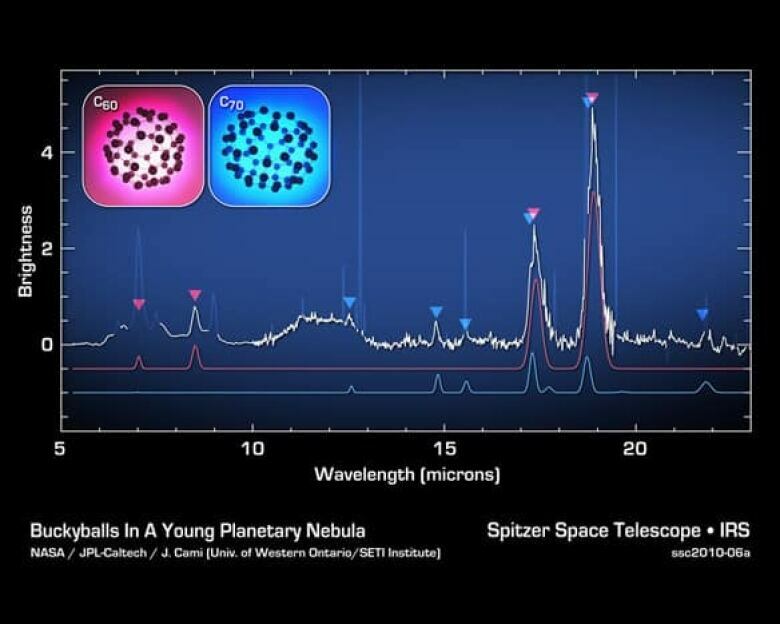 Fullerenes, also known as buckminsterfullerenes or "buckyballs," were detected about 6,500 light years from Earth in the cosmic dust of Tc 1, an object known as a planetary nebula, researchers reported in a study published online Thursday in Science Express. Scientists had long speculated that buckyballs, made up of 60 carbon atoms joined in a cage-like sphere, existed in space and might be responsible for light being mysteriously absorbed in space, said Jan Cami, an astronomer at the University of Western Ontario in London who was the lead author of the study. "Now that we know for sure that these fullerenes do actually exist in space … we can actually turn the question around and say … 'How big could their influence be in terms of these absorptions?' So that's a much more specific question." A planetary nebula such as Tc 1 is the last stage in the life of a star and is generally a colourful object with a small star called a white dwarf at its centre, Cami said. Molecules made of 60 carbon atoms and shaped like soccer balls were first discovered in the lab in 1985 by researchers at Rice University in Houston, Tex. Robert Curl, Harry Kroto and Richard Smalley received the 1996 Nobel Prize in Chemistry for the discovery. The molecules were named fullerenes or buckminsterfullerenes after the American architect and inventor Richard Buckminster Fuller, known to his friends as Bucky, who gained fame for designing geodesic domes of interlocking pentagons and hexagons. A similar structure is found in fullerenes made of 60 carbon atoms and in more elongated ones of 70 atoms, also known as C60 and C70 respectively. Fullerenes are one of three known structured forms of pure carbon, along with graphite and diamond. "It's surrounded by these layers of gases that glow typically in red and green. Those gases are actually what used to be the outer layer of the star." Researchers trained the Spitzer Space Telescope on Tc 1, which is visible at high magnification in the constellation Ara from the Earth's Southern Hemisphere. They measured the infrared light absorbed by molecules in its dust cloud, which are unique for each type of molecule and can serve as a chemical fingerprint to identify them. Jeronimo Bernard-Salas, a researcher at Cornell University in Ithaca, N.Y., and at Université Paris-Sud in Orsay, France, who specializes in studying the dust of planetary nebulae, noticed that the spectrum of Tc 1 was unusual. The dust didn't contain carbon chains or rings that are normally found near planetary nebulae. Bernard-Salas sent the spectrum to other researchers, including Cami, who recognized the signature as almost a perfect match for the fullerenes known as C60 and C70 (named for the number of carbon atoms in each). On Earth, buckyballs are produced in the lab by heating up graphite, the carbon material found in pencil leads, in the absence of hydrogen gas, with a little bit of helium. The researchers found that Tc 1 had an unusual environment that didn't have much hydrogen near it either. "And it's apparently exactly those conditions that you need to be able to efficiently produce buckyballs," Cami said. That doesn't mean the researchers think buckyballs in space are rare. "From our understanding … this might actually be a phase that a lot of planetary nebulae go through," Cami said. But he suggested there are two reasons why researchers had never detected buckyballs around planetary nebulae before. First of all, the stage at which fullerenes can be detected is likely short, at least on an astronomical scale. From their measurements, the researchers found that the buckyballs they detected were close to room temperature. That meant they were at a distance from the star indicating they were ejected about 100 years ago. In another 100 years, they would be so cold they would be undetectable, Cami said: "There's some luck involved — you need to happen to catch the object in the right stage." Secondly, researchers only recently built an instrument for the space telescope sensitive enough to measure something so far away.